HERE, AT LAST is a book of uncommon common sense for young people by someone who has worked with them for thirty-five years. 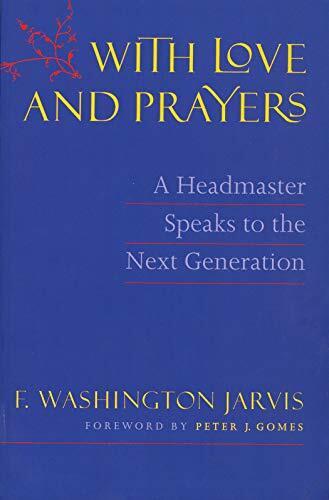 F. Washington Jarvis is one of the nation's most eminent educators, now in his twenty-eight year as headmaster of Boston's Roxbury Latin School, the oldest school in continuous operation in North America. Jarvis's approach is anecdotal. If it is true that a picture is worth a thousand words, it is ten times as true when you are speaking to young teenagers. They are gripped by the story of how real people cope with real situations. They are interested when you share with them the concrete realities of your own life and experience, and they are almost always willing to listen to adults who actually believe in something, who actually stand for something. Jarvis's addresses, reprinted from his school's publications, have enjoyed something of a cult underground circulation among young people - and their parents and grandparents. Now his top hits have been brought together in a single volume for wider circulation. The author never talks down to his audience. he knows that - appearances to the contrary - students are asking the deepest questions, questions about whether life has meaning and purpose. He also knows that teenagers often find themselves caught by surprise in situations where they have to make tough decisions. And he believes that they are willing, even eager, to know how others have coped in similar situations. This is a book of deep and practical wisdom, one of our surprise bestsellers in hardcover, and now available in softcover to serve an even wider audience.